I was listening to Changelog episode 242 and when James Long describes an typical yet ideal experience of posting libre code to Github as an unexpected burden, it jumped out to me that Github, Google Code, Sourceforge, and a dozen other libre code hosting sites can step forward to change that burden by altering the human language around posting a new project. An earnest developer wants to be known for creative thinking and their thesis is a code dump. Yet the environment of coders is young, scrappy and hungry: if it’s useful, the originator is bombarded by the obligations of maintenance and interaction of the audience. If things that were experiments, proofs of concept, or insights, were not subject to maintenance requests, what would happen? Would the authors gain a kind of reprieve from obligation to participate? Should services like GitHub develop a code diary publishing form such that these ideas can be read in terse form but not pulled? What form should appropriate feedback take? Comments, or a higher bar, such as patches? Or should we prohibit code in order to reduce obligation and encourage a longer form conversation: a code diary reply post? The anxious among us immediately worry that anything synthesized even as pseudocode is somehow salient knowledge: anyone reading and not replying might be copying and posting an app while the original author is doing his best to maintain a healthy sleep schedule. Is this anxiety actually unfounded, though? Unlikely. My point is really to focus on the how we can better steward notions of experiments, proofs of concept, and insights in a libre coding realm. The notion of having a one shot idea is perfectly valid for some people: they publish a proof of concept, something larger than a gist, yet beneath the definition of library or application. Maybe those notions can be automatically published only a markdown, or PDF. Or maybe they cannot be pulled or cloned. Or maybe the appropriate mechanism is for the publishing platform to synthesize an animation of the usage and help the author produce a technical blog post? What other language distinctions have I not touched on that might be pertinent? Are there other situations that could be considered? As a parent challenged with compulsive coding urges, I love this topic. Chime in! I’ve been doing a lot of disk cloning lately, working up instructions for duplicating a “sysprep” style Fedora image for the LANforge product. Now that live CDs tend to allow live installation of packages, I can boot one, plugin in a stick with the archive of my raw image, and install pv and lzop and I’m off to the races. I think this is super cool. After that gets thrown on the drive, you need to run parted on it to correct any partition glitches. Fsck the paritions after that. I hear a lot of very proud talk from various BSD zealots, mostly about how if you want better uptime/throughput/correctness, you should drop Linux like a rock crawling with centipedes and pick up the shinny golden nugget of FreeBSD. This will not work for me. While Linux might be “only good enough” in their eyes, in my eyes its been better than windows for over 20 years. I hear quiet, off-hand mumbling about the state of graphics drivers and laptop support on FreeBSD. I hear they just recently got preliminary support for UEFI booting. Various interviews with FreeBSD proponents often start with “oh, I started with Linux in the early nineties and it was a trash fire and I loved FreeBSD 4.x and haven’t looked back.” And “I hear Linux lacks proper jail support” and “Linux has a broken security model” and “SystemD is going to be the death of Linux.” Are these actually helpful points of view? You cannot support something you are not familiar with. Linux still makes a great desktop, server and embedded system. It’s got great tools. It runs zillions of servers and there is not a mass exodus to FreeBSD. To give a BSD or Linux box the kind of uptime, performance or security you want takes years of experience and knowledge of the subtleties of the platform. If you’re actually considering switching, start by doing a pilot project: build an evaluation stack and see if your workflow matches up to it. Bet you a buck the first thing you find is that paths, utilities and configuration defaults are going to get in your way for months until you build up your mental tree. FreeBSD zealots behave just as much like Linux zealots behave to Windows users. Often haughty, rude and dismissive. Let’s none of us be that way. Do not attempt to use PPA ubuntu/zfs-stable anymore, 15.10 will not accept it and it WILL mess with your zfsutils-linux recommended install. Somehow it did end up installing zfs-fuse. Somehow trying to install spl-dkms and zfs-dkms and uninstalling zfsutils-linux apt-get chose it. Why? All of this required starting off with build-essential, autotools, automake, auto… and libuuid and … stuff. Not difficult to chase down. I am able to reboot and import without pool version warnings. Why did I move off 14.04.x? I really want to do video editing for kid videos and all the video packages for 14.04 are way ancient. once LXDE displays, then I do a “apt-get install mate-desktop-*” which seems to work just fine. Why? lubuntu-desktop flawlessly sets up Xorg dependencies and gives me a desktop the first time without messing around wondering why mate-desktop didn’t. 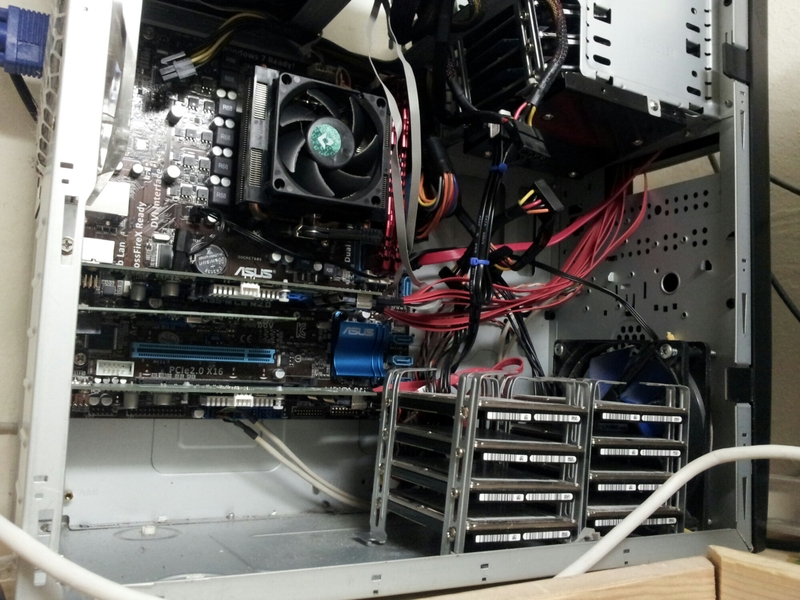 Here is my ZFS on Linux story, and some of you might have seen these pictures when I started this project last year: I recycled an old Athlon system from work and placed an 35 Watt AMD A2 processor with 8GB 1600 ram on an Asus mobo in it. 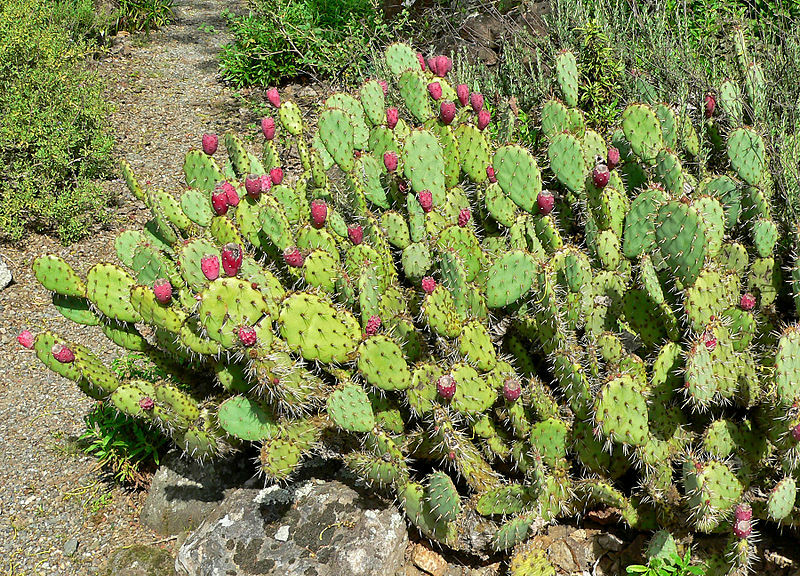 I name my home systems after after cacti, and after I installed Ubuntu 12.04 on it, I named this one Beavertail.bitratchet.net. My previous experiences with storage systems involved them dying from heat. So I decided I would avoid full sized drives and stick with laptop drives and boot off an SSD. I have the SSD partitioned with a /boot, root, and two more partitions for ZIL and L2ARC. The bulk of the storage is a mix of 750GB Hitachi and 500GB Toshiba laptop hard drives, 16 total. I have lost two drives in this system, which I would label “normal drive attrition.” Boot drive is a 128GB OCZ Vertex 2. Half the drives are on the bottom, and half are on top. At work I have access to gobs of full-height card brackets and this is what I built drive cages out of. To get all the drives wired up, I started with a bunch of 1x and 2x PCIe sata expanders and used up all my mobo sata ports, but by the time I got to about 12 drives, I only had a PCI slot left, so had to use that. When looking at my disk utilization in iostat -Nx and dstat --disk-util it was plainly clear that I had a swath of drives underperforming and they were all connected to the slowest PCI controller. I saved up and remedied that by purchasing two SuperMicro SAS HBA’s with Marvel chipsets. They are only 3G SATA (equivalent) but they each control eight drives, and they do so consistently. 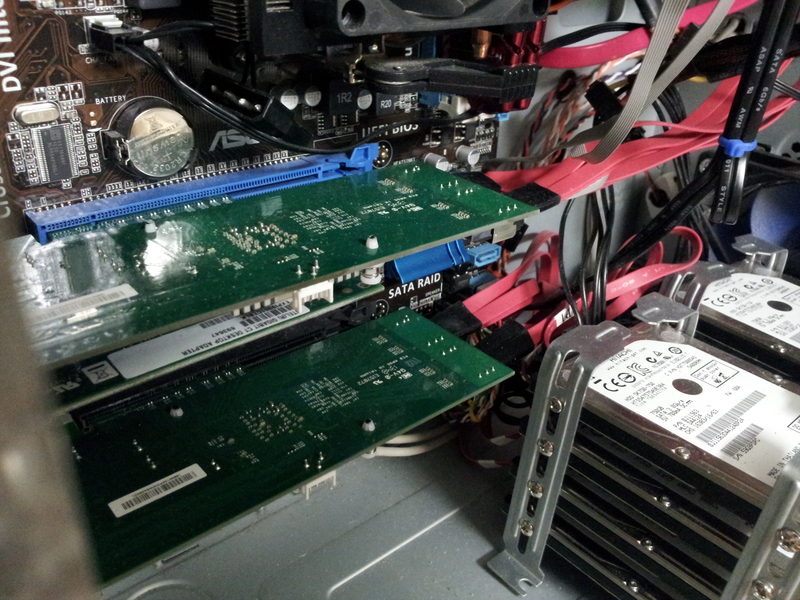 They take 8x PCIe lanes, and that’s great use for the two 16x PCIe slots on the mobo. It took me a while to find out my network bandwidth issues. The problem was my motherboard: it has an onboard Realtek chipset. It would max out at 500Mbps download and 250Mbps upload…and very often wedge the system. I got a PCIe 1x Instell card and I got a good clean 955Mbps both ways out of that with one iperf stream, and 985+Mpbs with two iperf streams. To actually achieve this, I needed to put an Intel nic in my workstation as well. (My switch is a 16-port unmanaged Zyxel). 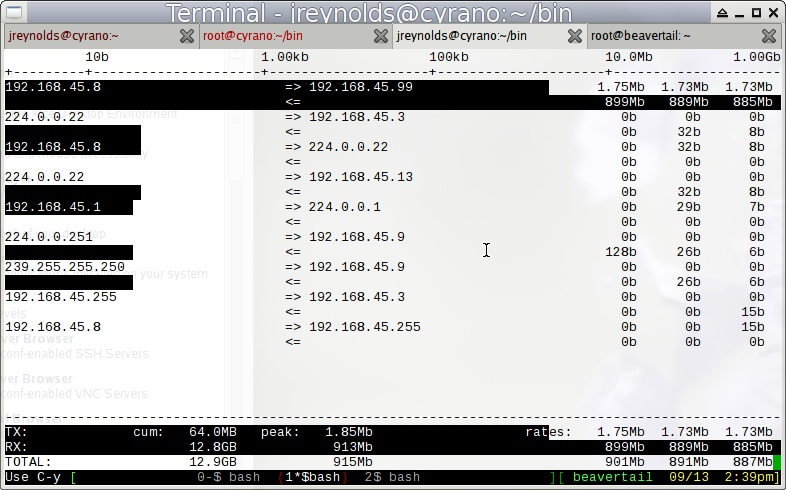 I am able to push close to full network capacity to Beavertail. As you can see, the results speak for themselves: the screenie below shows iftop displaying better than 880Mps and I saw it grab 910Mbps during this backup. Clearly part of the success is having a Samsung 840EVO in my laptop, but having a stripe of four zvols clearly allows plenty of IO headroom. 910Mbps transfer from laptop to NAS. Do not rush to install new mainline kernels, you have to wait for dkms and spl libraries to sync up with mainline and to send out PPA updates through the ubuntu-zfs ppa. If you do a dist-upgrade and reboot, and your zpool does not return on reboot, this is easily fixed by doing a ubuntu-zfs reinstall: apt-get install --reinstall ubuntu-zfs. This will re-link your kernel modules and you should be good to go. Like I said, this has been working for four releases of Ubuntu for me, along with replacing controllers anbd drives. My only complaint is that doing sequences of small file operations in it tends to bring the speed down a lot (or has, have not recreated on 14.04 yet). But for streaming large files, I get massive throughput…which is great for my large photo collection!